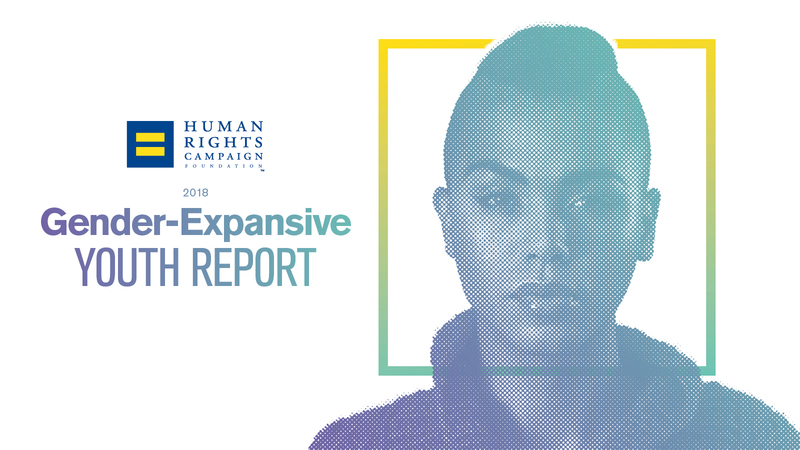 Today, HRC Foundation and the University of Connecticut released a new report detailing the alarming challenges and barriers facing transgender and gender-expansive youth around the country -- and their perseverance in the face of discrimination and harassment. The findings, which focus on the experiences of transgender and gender-expansive youth both at school and at home, were drawn from the 5,600 transgender and gender-expansive youth who participated in HRC’s groundbreaking 2017 LGBTQ Youth Survey. Less than a quarter of transgender and gender expansive youth feel like they can definitely be themselves at home. Seventy-two percent of transgender and gender expansive youth report hearing their families make negative comments about LGBTQ people. Sixty-nine percent of transgender and gender expansive youth have received unwanted sexual comments, jokes and gestures. Transgender and gender expansive youth are roughly twice as likely to be sexually assaulted or raped because of their actual or perceived identities than their cisgender LGBTQ peers. Less than a quarter of transgender and gender expansive youth can definitely be themselves at school. Only 16 percent of transgender and gender expansive youth always feel safe at school. Forty-two percent of transgender and gender expansive youth have received physical threats due to their LGBTQ identity. Fifty-one percent of transgender and gender expansive youth never use restrooms at school that align with their gender identity. The report also outlines steps families, schools and lawmakers can take to support and protect transgender and gender expansive teens, including advocating for inclusive non-discrimination protections for LGBTQ people at the local, state and federal levels, and comprehensive training for school faculty and staff. In May, HRC released the 2018 LGBTQ Youth Report, which detailed the overall findings of the 2017 LGBTQ Youth Survey and its 12,000 respondents nationwide. The U.S. lacks reliable data about LGBTQ people, especially about the experiences of transgender youth. In light of this, and in the face of consistent attacks on LGBTQ youth, HRC is ensuring that this data is in the hands of teachers, counselors, coaches, doctors and other youth-serving professionals across the country. These findings will inform a variety of HRC Foundation programs for youth and youth-serving professionals, including the Welcoming Schools program, the All Children-All Families program and the Time to THRIVE conference. The full report on the experiences of transgender and gender expansive youth can be found here.